This draft manuscript is an introductory Python tutorial for linguists. 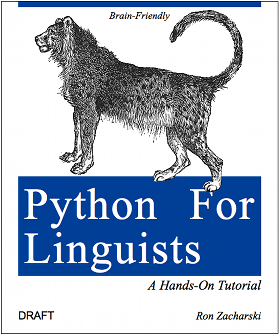 The book covers the rudiments of Python programming, writing simple programs for corpus linguistics, and writing programs for computational linguistics. The chapters are in PDF format and can be viewed and printed using the free program, Acrobat Reader. I would like to acknowledge Steve Bethard (http://ucsu.colorado.edu/~bethard/) who graciously helped in a recent edit of these chapters. This draft is not connected in any way to O’Reilly Media. To save the file to your computer, right mouse click on the link and select ’save as’.